Decision making is nothing but comparison of alternatives and eliminating options one by one! Do it more effectively than ever before by comparing two alternatives side-by-side. You can show same content on either left or right display any time without using any touch panel from AltraTOUCHContentTM monitor provided. Further you can annotate on the last shared content. If you want to annotate on other content, just share it and annotate. Also get high quality cable management boxes that come with smallest footprint & embedded MajikSWITCHTM. Universal power sockets and all enclosed cables keep you ready 24×7 for your global visitors! Always available cables with universal power sockets and USB charging points for your hand-held devices keep the system 24×7 ready for making presentations. 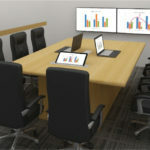 Connect and toggle among multiple sources/presentations just by pressing MajikSWITCHTM – no need of any touch panels. Wireless Presentations from PC, Android and iOS devices along with wireless presentation annotation and whiteboard! BOSPL CableCILLIN 3 Nos. / 3 Nos. / 5 Nos. / 5 Nos. 4 Nos. / 4 Nos. / 6 Nos. / 6 Nos. / 8 Nos. / 8 Nos.